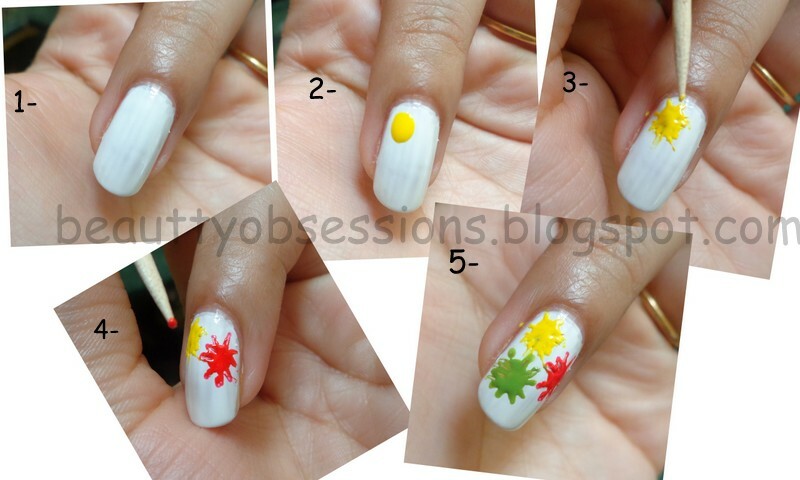 Colourful Splatters on Nails...- Tutorial !! Now jump to the tutorial.. Normally splatters are done by straws,but here I have drawn a free hand splatter nailart..
4- A fine brush or a tooth pick..
1- Apply a thin layer of base coat to protect your nails.. Then apply a good layer of white paint. Here I am using white as a base colour as other bright colours will pop up properly on white base..
2- Then take the yellow colour (any colour as per your wish) and put a drop on your nail ( no need of a dotting tool, you can put that drop directly with the brush with the nail polish). 3- Then don't allow it to dry, immediately take a fine brush or a tooth pick and drag /pull the drop from its sides to outward direction. Hope you can understand what I am trying to say.. Follow the picture..
4- Then follow the same method with some more colours.. And here is the final look. Woww so beautiful. Loved the look. Love the nail art. So cute. So colorful and bright! Reminds of holi... Good work! Superb, Snigdha :) Pretty splatters! So so colourful, Loved it. You getting pro in this.